Over the years during Kevin Bertoli’s time travelling to South Korea, often at times when relations were considerably strained, people have always seemed to take the North Korean issue very much in stride. Now, the ever-escalating threats between North Korean leader Kim Jong Un and President Trump over the past year has seen tensions on the Korean Peninsula reached an unprecedented level. The level of vitriol witnessed since President Trump took office goes beyond the last major spike in tensions in 2010 when North Korea was accused of destroying the ROKS Cheonan, a South Korean naval vessel, killing 47 sailors. The state of affairs on the Korean Peninsula has been a constant theme for those investing in Asia over the last decade. Given the consistency at which the strained relationship between the two Koreas makes front page news, much of the rhetoric gets received with a ho hum attitude from investors. On the surface, this seems to be the case now. When surveying South Korea’s equity market, at first glance it to would look like there has been little to no impact at all. The Korean KOSPI index has advanced over 20% since President Trump took office last year and now sits within 5% of its post Global Financial Crisis highs. This is in large part due to the significant weighting to Samsung Electronics – 20% of the index – and other technology names that are essentially global businesses, largely immune to sentiment surrounding regional issues. However, at a deeper level there are differences. While the tensions between North and South are nothing new, this time the relationship between South Korea and China has become much more strained. The root cause being one five letter acronym - THAAD. Given the increased threat posed by a rogue North Korea and at the prompting of the United States, the South Korean government proposed to install Lockheed Martin’s Terminal High Altitude Area Defense system (THAAD). This decision was met with significant opposition from China who claim the system would be used by the United States to monitor China and Chinese interests in the East China Seas. China subsequently introduced “soft sanctions” on South Korea and South Korean companies. Rising animosity between South Korea and China has made it harder for South Korean companies, including confectionary manufacturer Orion Corp. and automotive giant Hyundai, to operate in China. Most impacted however, has been the mega conglomerate Lotte Group, which had agreed to sell a parcel of land to the Korean Government to become the site for the first THAAD system base. Lotte Group companies faced boycotts in mainland China, and at one point, Lotte Shopping, the retail arm of the group, saw the forced closure of the vast majority of its over 100 retail locations in China for ‘health and safety reasons’. One of China’s most disruptive soft sanctions has been the directive to local tour companies to cease issuing travel packages to South Korea. Consequently, South Korea went from the second most popular offshore destination for Mainland Chinese tourist to sixteenth and visitor arrivals fell by almost 50% year-over-year in 2017. Chinese tourists represent the largest market for Korea so industries reliant on the tourist trade have been hit extremely hard. Two of the clearest examples of this have been the gaming and cosmetics sectors. 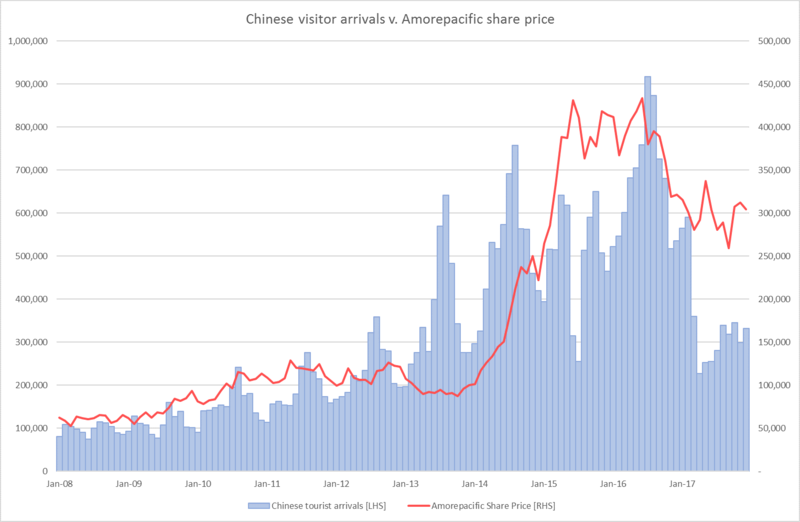 Paradise Co., the operator of 5 domestic casinos heavily reliant on Chinese VIPs and Amorepacific Korea’s leading cosmetics company saw peak to trough declines in their share prices of 70% and 45% respectively. At the height of last year’s tensions – somewhere between President Trump’s “little rocket man” and “my red button is bigger than your button” Twitter storm – there was little consideration that the bluster displayed from both leaders would turn into constructive talks. However, there has been a dramatic about-face in the last few months, first with the grand gestures witnessed at the Pyeongchang Winter Olympics and now with reports CIA director Mike Pompeo travelled to North Korea to meet with President Kim Jung Un in advance of the historic talks between the U.S and North Korean leadership. Recent developments, while yet to achieve any tangible successes, are a step in the right direction. The path forward is unlikely to be easy and if history is any guide will no doubt be littered false starts along the way – it is worth remembering the Korean armistice agreement has remained open for 55 years! At a minimum a return to some level of normalcy on the Korean Peninsula should also facilitate improved relations between South Korea and China. More conciliatory overtures from South Korea’s new President Moon Jae-in already looks to have had a positive outcome. We suspect as the relationship between the two countries improves Korean corporates who have felt the brunt of China’s wrath should see conditions improve. Consequently, we have increased the exposure to South Korea across our two Asian Funds – South Korean equities now account for approximately 15% of the invested capital in the Asian Companies Fund and Asian Opportunities Fund up from low single digits 2 years ago.